After a Simpsons-themed lunch (complete with all sorts of tracks from "Mr. Plow" to the Kamp Krusty song), we started back up with Napoleon Dynamite, which brought a large crowd of producers and talent to the room. I've never been a fan of that movie, though I do enjoy seeing people dressed as the characters at parties, if that counts for anything. I don't know if there was a general lack of interest in the new show or if people were in a mini-coma from their Simpsons donuts, but the questions just weren't that good... I mean, when you're an animated character, it's cool to hear about who your animated inspirations might be, but I don't know that we needed to force a response from each person. 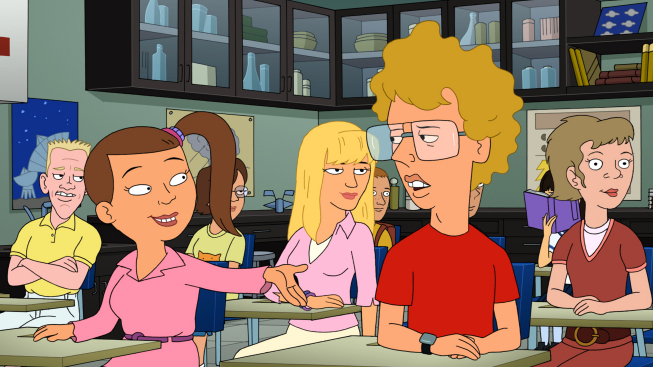 On that note, Jon Heder (Napoleon) loves Otto and Jimbo Jones on The Simpsons, and Tina Majorina (Deb) always wanted to be part of Scooby Doo's gang. The best thing about the movie becoming an animated TV show? Ligers. You can't really do that in real life. One big change? LaFonda isn't on the show... yet. They wanted to be able to explore Kip's dating life a bit first. Something strange? Jon Heder and Jared Hess had a workshop to work on Napoleon's giggling... that involved tickling one another. The etymology of "Napoleon Dynamite" as a name? Jared Hess was doing his (Mormon) mission in Chicago and met an old Italian guy there who introduced himself as such. Hess wrote it down. The Finder is a show that, in my opinion, has received VERY LITTLE publicity, considering that it premieres this Thursday. First of all, let's talk about how this (very quirky) show got its name. Oh, that's right. Nobody could come up with anything better. Failed ideas include Location, Location, Location, The Boy Wonder, Lost and Found, and, simply, Finder. Hats off to the journalist who asked why the title was so flat. Where did the idea for the show come from? Well, it was conceived to be a partner to Bones, which Hart Hanson (who appeared via Skype, due to motorcycle injuries preventing his attendance in person) is "very confident" will come to have an eighth season, which he'd "like very much to do." What's the show about? Well, George Stults (remember him from 7th Heaven?) plays Walter, an Iraq war vet living in the Florida Keys ("if you turn on the news, all the goofy people live in Florida - Geoff Stults). He is "a remarkable man with the extraordinary ability to help people find the unfindable." Walter believes that whether or not he's truly gifted doesn't matter, because he believes it. I'm gonna pass, what about you? FOX then took some time to have a panel about some of their returning comedies this spring, Breaking In, New Girl, and Raising Hope. 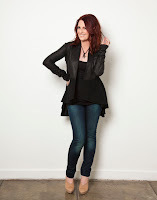 Yes, that's right, the previously-cancelled Breaking In is back, adding Megan Mullally to the cast. This isn't the first time that she's joined a show late in the game (Party Down the movie, by the way, is currently being written), and she just had her first day shooting on Friday. Mullally joins the cast as a rule enforcer, as the company portrayed in the first season has been "bought out by a stuffy, multi-billion dollar, global corporation." Adding her character, Veronica Mann, was needed to create a foil for Oz, noted Adam F. Goldberg, Executive Producer. And, although the Raising Hope babies were not present this time, there were still a couple of references to them throughout the panel, the most amusing being that Greg Garcia (Executive Producer) said they'll ask the girls' parents about what they're doing that's funny, and then they'll write that into the show. I think that makes a lot of sense, but it's probably something that everybody does and we just don't hear about it, LoL. There were also a handful of questions for New Girl, but I'm not going to bother talking about them, other than to let you know someone actually asked what type of cereal Zooey (and sister Emily) Deschanel ate growing up. Snack break! Bob's Burgers had a bunch of sliders and a couple of different types of fries, plus ice cream sundaes and mini-pies. I heard that there were onion rings, but they were gone by the time I got to the front of the line! The final panel of the day was for American Idol, which I almost didn't stay for. 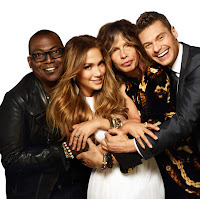 As you have probably realized, we don't talk much about American Idol here on TheTalkingBox, except during awards season, where it pops up rather frequently. Of course there were some questions regarding the judges' and host's personal lives, like how Jennifer Lopez balances work with being a mom. Ryan Seacrest reminded us that he was only 27 when he began working on American Idol. A few folks tried hard to find out what else the man's got going on, but he kept a zipped lip. Steven Tyler announced that the songs for Aerosmith's new album have already been written, but only about half have lyrics right now. The other pushed topic was The Voice as a direct competitor to American Idol, which none of the talent seemed to think was a true problem. Mike Darnell, President of Alternative Entertainment at FOX, said that American Idol "is the gold standard." Executive Producer Cecile Frot-Coutaz added that the marketplace is just so much more competitive now. When American Idol started, it was the only show of its kind. And, Randy Jackson reminded us that The Voice has contestants who have previously ha record deals. American Idol isn't really the "here's a second chance" show. So, if you want to give the eleventh season of the hit reality show a try, it premieres on Wednesday, January 18th and Thursday, January 19th. ...and that's a wrap, folks! Hope you enjoyed our recaps of the panels!